Senta-9 Athletic Earbuds that don't fall out! Many of us here at Center Point Audio use earbuds daily. At the time we began development of the Senta-9 earbuds, many of us were using sets that sounded great, but suffered from a few common issues. The most common complaint was the fact that no matter what we did (or how much we had spent on our earbuds), they always seemed to fall out of our ears somehow. And when earbuds are pushed in far enough to stay there, they are really uncomfortable. We also found that we had all shared the frustrating experience of tangled earbud cords. So when we set out to create the ideal set of earbuds, we already understood the importance of correcting these issues. Earbuds that Don't Fall Out! Anyone who has tried, knows how difficult it is to find earbuds that fit comfortable and don't fall out of your ears. Well, we ran into this problem and solved it by creating the Senta-9 earbuds. Most earbuds are designed so that the cord hangs straight down. This creates opportunity for gravity and accidental cord snagging to pull on the earbuds, causing them to fall out. It also doesn't help any to have earbuds that stick out enough to increase gravitational leverage caused by the weight of the earbuds and cord. 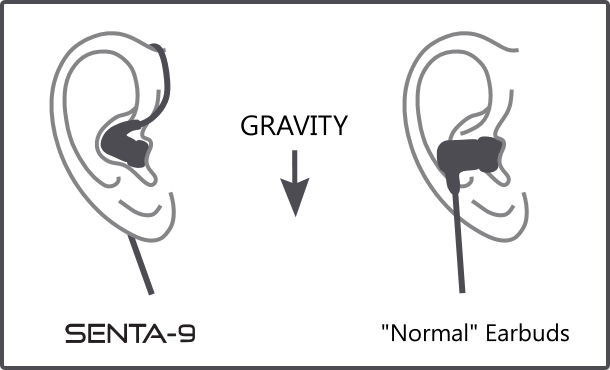 We designed the Senta-9 earbuds so that the cord is routed over the top and back of the ear. This prevents the force of gravity or snagging from directly pulling on the earbuds. We've also included soft "ear-hooks" to ensure the cords stay in place on the ears. By using 9mm drivers and angling the driver aperture, we achieved a lower-profile design which provides better comfort and less gravitational leverage. One of the indirect benefits of this low-profile design is that the Senta-9 earbuds are less visually conspicuous. Many people find earbuds to be uncomfortable. Some weigh this discomfort against the benefits of earbuds and adjust to the inconvenience. Others may just avoid using earbuds all together. Because of the design of the Senta-9 earbuds, they do not need to be pushed into the ear canal causing discomfort. With the cord wrapping over the top of the ear, gravity is unable to directly pull on them. The result is an earbud fit that is not only secure, but also incredibly comfortable. A Cord that Won't Tangle! When it comes to earbuds, few experiences are more frustrating than tangled cords. Sorting out a convoluted mess of small wire is the last thing anyone wants to do when they're ready to listen to music. Although they work well, using a cord organizer just means one more thing to carry around. After much research, we were able to find a cord coating material that not only makes the cord resist tangling, but also minimizes microphonics. Microphonics is a phrase that refers to the noise caused by physical movement of the cord. With the low microphonics cord you can hear more music, and no longer hear the sound of the cord bumping on your clothing etc.. The tangle resistant cord makes using the Senta-9 earbuds ultra convenient. Holding the plug end and shaking gently causes the cord to easily unravel itself.